Sacred mountain climbed by pilgrims of all religions for more than a thousand years. The seven kilometre route can take between 2 – 4 hours, but you will be rewarded with breath taking views at the top. An isolated plateau at 65000 ft of rhododendron forest and grassland, a hike can take you to Worlds End, a sheer drop of over 1600 metres. 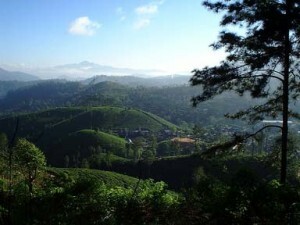 “Little England” the original Hill Station of the British tea planters. Take a rest at the Hill Club, tea on the lawns of The Grand Hotel or try St. Andrews over looking the golf course. You can take a train journey through the mountain scenery, water falls and tea plantations. Location of Sir David Leans film “Bridge over the River Kwai”. The last capital of the ancient Kings in a valley surrounded by hills. 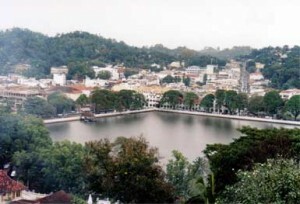 Visit Dalad Maligawa the Temple of the Tooth which holds the relic of Buddha’s Tooth in a gold casket. Take a scenic drive around the lake and in the evening visit a cultural show of Kandian drummers, dancers and fire walkers. The Peradeniya Botanical Gardens has trees from all over the world, a palm garden and orchid house. You can see hundreds of large fruit bats hanging from trees and along the banks of the Mahaweli River where massive bamboo grow. 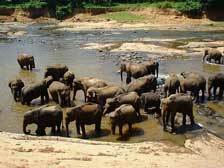 You can watch elephants bath in the Maha Oya River and see the babies bottle fed at the Pinnawela Elephant Orphanage.